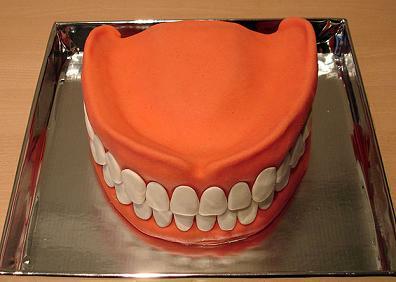 This Teeth Cake is the perfect birthday or celebration cake for your dentist or your hygienist. Can you imagine making a dessert like this? I don't think I would ever let anyone cut it. We'd have to get someother sweets to eat. This cake is made with fondant icing. Fondant is like play dough for cakes. It is completely edible and you can roll it, mold it or shape it into many different designs...like a set of teeth, for example. You can learn more about fondant icing and how to make fondant on our site. You can also find our favorite quick and easy marshmallow fondant recipe. Read about how to use this wonderful icing to create your own works of art. You can also learn where to find other, easier ways to decorate your homemade cakes by visiting The Party Works. This is an online cake decorating web site where you can find edible cake images, sugar decorations, cupcake and cake decorating ideas and party supplies. Be sure to give them a look when you want to bake your own birthday cakes.